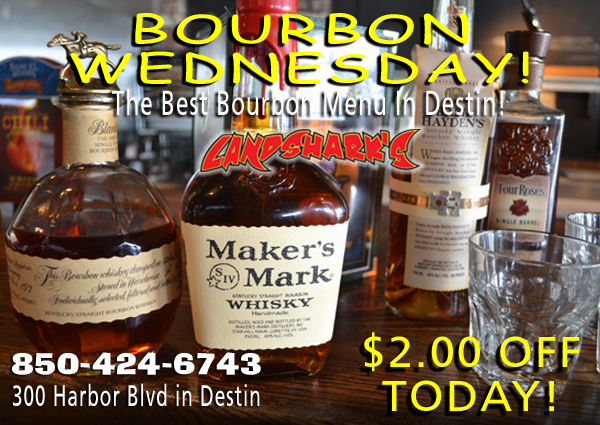 / Best Hot Wings in Destin FL / Landshark’s WORLD SERIES GAME 7 WINGSDAY – Wings 69¢ Ea & TOP SHELF BOURBONS $2 Off|College, NBA & More! 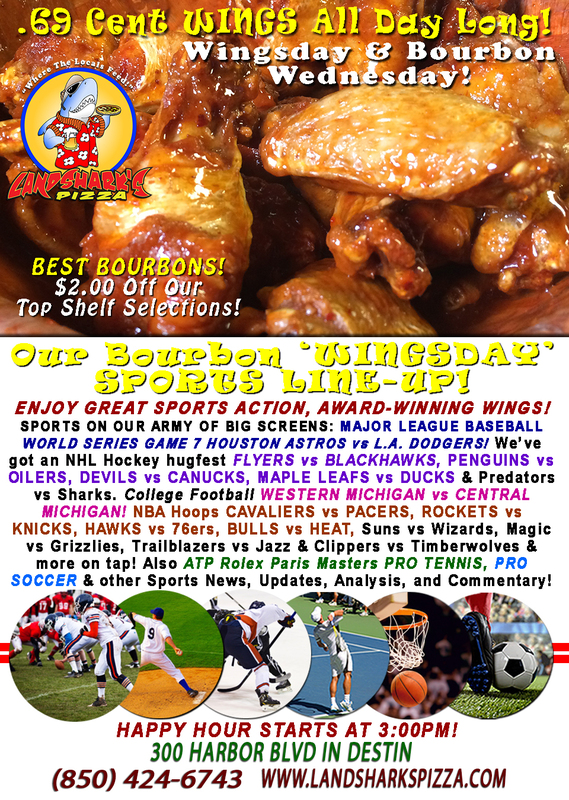 Landshark’s WORLD SERIES GAME 7 WINGSDAY – Wings 69¢ Ea & TOP SHELF BOURBONS $2 Off|College, NBA & More! We are blessed with another warm & sunny Destin Humpday with mountains of tasty wings ready to go for our fabulous WORLD SERIES WINGSDAY for GAME SEVEN here at Landshark’s! 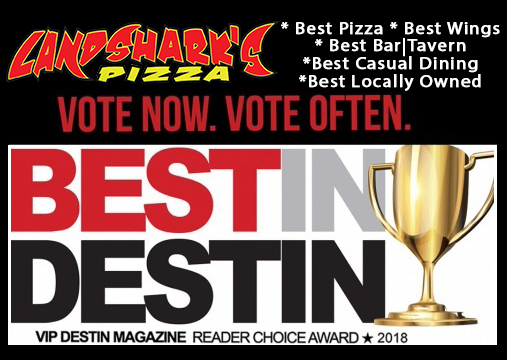 Award-Winning, juicy & delicious Landshark’s Buffalo Hot Wings. Dive into a batch of mouth-watering, crispy, juicy & spicy satisfaction for only 69¢ each ALL DAY LONG! SPORTS ON OUR ARMY OF BIG SCREENS – Wing Wednesday WORLD SERIES HOUSTON ASTROS vs L.A. DODGERS! NHL hugfest FLYERS vs BLACKHAWKS, PENGUINS vs OILERS, DEVILS vs CANUCKS, MAPLE LEAFS vs DUCKS, & Predators vs Sharks! College Football WESTERN MICHIGAN vs CENTRAL MICHIGAN! NBA Hoops bonanza includes CAVALIERS vs PACERS, ROCKETS vs KNICKS, HAWKS vs 76ers, BULLS vs HEAT, Suns vs Wizards, Magic vs Grizzlies, Trailblazers vs Jazz & Clippers vs Timberwolves. There’s also ATP Rolex Paris Masters PRO TENNIS & PRO SOCCER action plus plenty other Sports Broadcasts, Sporting News, Analysis, and Commentary! College Football This Week: (Thurs) Navy vs Temple & more.|(Fri) #22 Memphis playing. NFL This Week: (Thurs) Bills vs Jets. 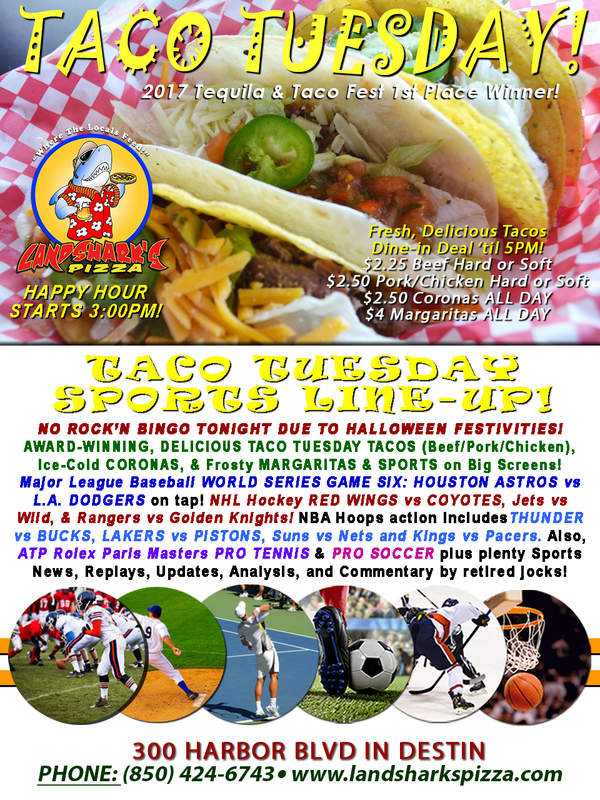 Previous Post: « Landshark’s Halloween WORLD SERIES TACO TUESDAY ASTROS vs DODGERS! Tacos, Corona, Margarita Specials & COLLEGE FOOTBALL!